Summary: The Carnegie Endowment for International Peace is pleased to launch Carnegie India, its sixth international center. NEW DELHI—The Carnegie Endowment for International Peace is pleased to launch Carnegie India, its sixth international center. 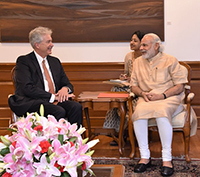 In a meeting with Carnegie President William J. Burns, members of Carnegie’s board of trustees, and Carnegie India staff in New Delhi, Indian Prime Minister Narendra Modi welcomed Carnegie’s initiative to open the center, saying that it is reflective of democratic traditions and liberal thinking in the country. Prime Minister Modi expressed his hope that the center would further promote the climate of research in India, especially among youth, and would strengthen the strategic partnership between India, the United States, and the rest of the world. Carnegie India’s research and programmatic focus will include the political economy of reform in India, foreign and security policy, and the role of innovation and technology in India’s internal transformation and international relations. Led and staffed by Indian experts, it will build on decades of scholarship on India and South Asia across Carnegie’s programs, while placing special emphasis on developing a cadre of young, up-and-coming Indian scholars. The center’s founding director, C. Raja Mohan, has been a nonresident senior associate at Carnegie since 2012. He has also served as a distinguished fellow at the Observer Research Foundation in New Delhi, a visiting research professor at the Institute of South Asian Studies, National University of Singapore, and a member of India’s National Security Advisory Board.